Full attunement to Angelic Reiki 1st and 2nd Degree levels. The 7 symbols given are activated to Angelic level through the 7 levels of form and Divine form by Archangel Metatron. Guidance re self healing, absent/distance healing, treating pregnant women, children and animals. Techniques to attune healing tools. A Master Crystal to hold the Angelic Codes of Healing. Certificate of training achievement to 1st and 2nd Degree Angelic Reiki. 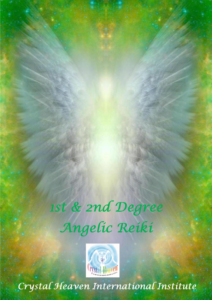 I have just completed the Angelic Reiki 1 and 2 a fantastic experience I will never forget! 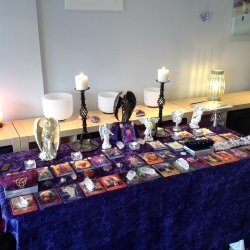 Angelic Reiki is the most fabulous energy I have ever felt, working with the Angels is just amazing, Neil and Zena are lovely so welcoming they made us all feel comfortable and looked after us so well. I would recommend Crystal Heaven and this course to anyone interested in healing and working with Angels. The cost of this Workshop is £252.00 with a non refundable deposit of £50 to secure your place, with the balance required two weeks before the start of the workshop. After booking please fill in our Booking Form to confirm your place and advise us of any special requirements such as mobility issues.